Front upper adjustable control arms, flex joints and hardware. 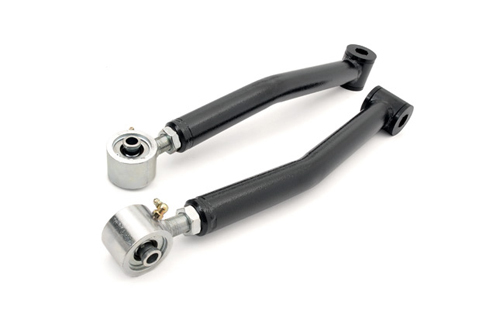 Fully adjustable control arms replace your factory stamped sheet metal OE arms and allow for better articulation and more control off road but does not sacrifice on road handling. They feature our rebuildable X-Flex joints, are fully greasable, and come with highly durable polyurethane bushings. A must have for a trail ready Jeep.